My Name is Noha, I’m 18 years old. I think have been wearing hijab for almost 5 years now. The reason why I chose to wear my hijab is simple. I feel my headscarf, is the most important part of my identity. As a little child I used to argue with my parents, about my headscarf, because I wanted to wear it as a little girl, but they wouldn’t let me. They said that I should wait, until I got older. When i got older, I chose to to wear it and that it is the best decision I made in my life. I actually thought that wearing hijab will take a lot of trouble finding workplaces and in school and that people wouldn't like me. In social media people are continuously talking about hijab as a big problem. But when I started wearing hijab as a normal girl, I actually found out that it wasn't such a big problem. If you make it a problem – than it is your problem. But nothing will happen, because hijab is just a piece of clothing. It just hides some parts of me, like my hair, but not the person I am. 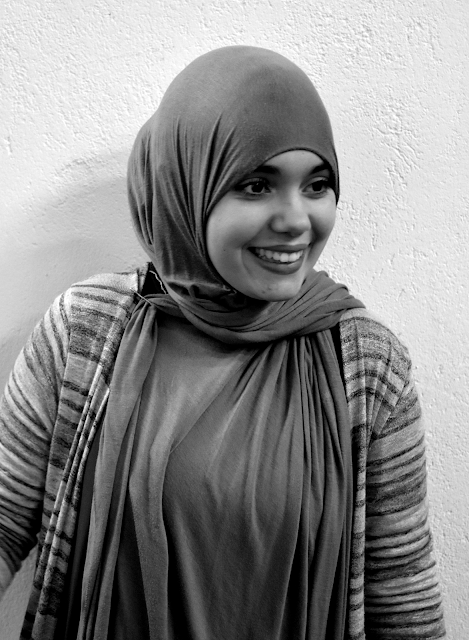 I don't see that my hijab causes any problems – I love it! I'm thankful, that everybody, who is around me accepts me as I am. In my workplace, I'm working in a shop for almost four years, my boss didn't like muslims so much in the beginning. But she gave me a chance. When I started, she found out that wearing hijab isn't a problem and I am like everybody else. When there is somebody in the shop yelling at me, she would actually stop them: “she is one of the best workers in my shop! Stop yelling at her!”. I think that, if you make hijab a problem, it will be a problem. But if you don't, than you will find out, that hijab is just a part of me.